Vivienne Westwood creates a window to another world with a dazzling crystal set dial that features the iconic orb motif, creating luxurious texture and housed in a rose gold tone case, with the bezel featuring Roman numerals for easier time keeping and infusing the piece with a gentle reference to traditional watch design. 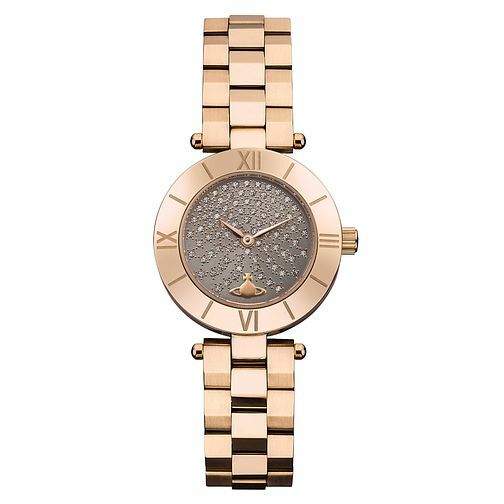 Vivienne Westwood Westbourne Ladies' Rose Gold Tone Watch is rated 3.0 out of 5 by 1. Rated 3 out of 5 by Anonymous from Product difficult to fasten The watch itself is very stylish and exactly as seen online. The issue was the clasp which was a butterfly clasp. Found it really tricky to take the watch iff when wearing and really disappointed so much so that I have since returned for a watch with a more standard fastening mechanism.